Are there tools that can prompt the user every time an executable uses system functions? As a programmer I don't use anti-virus programs for a simple reason: I found that viruses are only detected once the executable or a part thereof has been explicitly blacklisted by the anti-virus developer. Now I'm wondering if there are tools that can simply place themselves as another layer on top of the operating system's API. And allow the user to create a whitelist of which function each executable may access. It would also be nice to get a pop up every time new function is called, revealing the passed arguments asking the user if the wants to grant/deny access. So that I could for example specify which file/folder/registry/process entry can be read or modified. And also things like which devices can be used, which IP addresses can be communicated with etc. I know such tools exist for Android (Xprivacy), but I'm curious if tools like this also exist for Windows, Linux and Mac OS X. And I'd also like to know if there is a technical term for this kind of a tool, as I don't think it would fully fall under the category "anti-virus program" or "firewall". First of all, antivirus software doesn't only use a signature database of complete or partial files. This software also uses behavioral detection to protect from unknown / zero-day malware, for example by monitoring which areas it's trying to access or which files it's trying to change. Behavioral protection is already included in the popular basic antivirus products - you don't need to get an extended internet security bundle for that. This is why there are false positives from time to time - the more there are, the more crudely the antivirus engine is tuned. 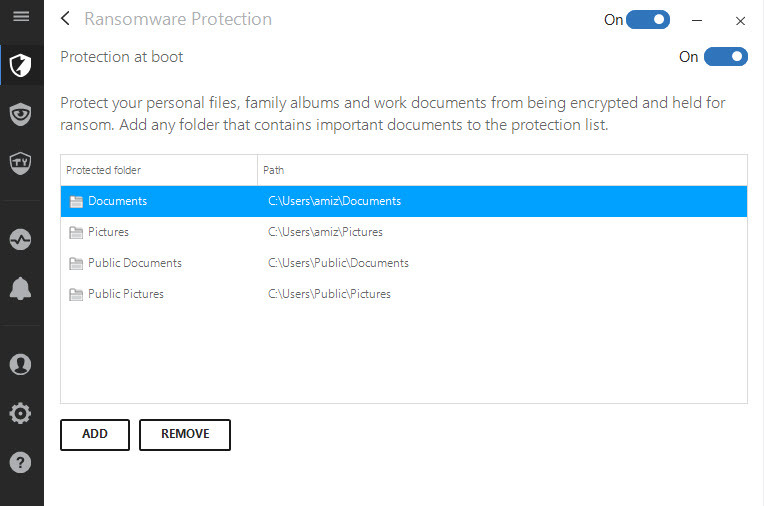 Extended protection and permission management for specific files/folders or areas of your computer. WinPatrol is available in a free version, which offers a handful of ways to monitor just what's going on on your PC. You can see a list of startup programs, which you can choose to disable or delay. You also can see a list of recently used programs, hidden files, file types by associated program, active tasks and services, and much more. Check it out, this might be something you will find useful as an addition to an active antivirus protection. Affiliation disclaimer: I'm not affiliated with WinPatrol in any way, but I work for the antivirus reviews site from which I took the image. An application firewall is a form of firewall that controls input, output, and/or access from, to, or by an application or service. It operates by monitoring and potentially blocking the input, output, or system service calls that do not meet the configured policy of the firewall. Yes, there are implementations of this for all major operating systems. For example AppArmor is a Linux kernel security module that allows app developers or packager to write profiles for an application. However, these kinds of tool is usually considered too difficult for most end users to generate a profile. So most of the time, AppArmor profile would be written by packager or the app developer rather than by end users. The problem with such tool is that even in simple applications there would be many false positives and you usually need deep knowledge of the application internal to figure out what is and what is not acceptable. Many antivirus product also have behavior detection, this usually goes by the name heuristic analysis or behavioral analysis. Note that for many parts of heuristic/behavioral engine to work you have to actually execute the program, so online antivirus like virustotal usually may not detect them. Behavioral detection are usually tuned to detect malware that attempts to hide itself in system files, gain privilege, or do other such things that destroys system integrity, malwares that works entirely from userspace like Ransomware are generally much harder to detect with behavioral analysis without producing lots of false positives. If you are running Windows XP (32-bit), the older project WinPooch might be your answer. Not the answer you're looking for? Browse other questions tagged windows linux antivirus whitelist or ask your own question. Possible to detect packed executable? Are there any exploits that would allow a user to “spoof” a screen capture system? Is there vulnerabilities that are inherent to the concept of an open source antivirus? Can a root user inside a Docker/LXC break the security of the whole system?